Why and how do we Quality Assure (QA) websites at the BLWA? 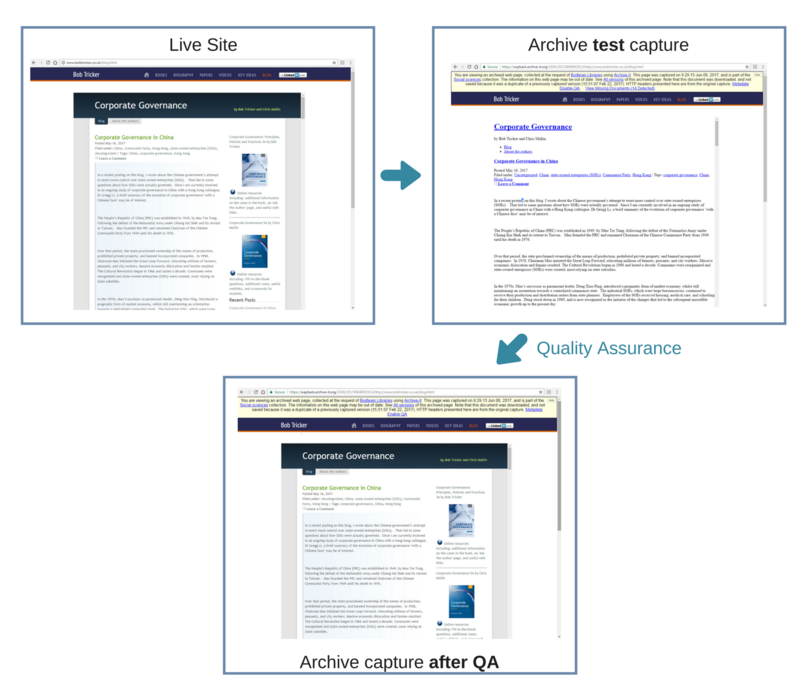 At the Bodleian Libraries Web Archive (BLWA), we Quality Assure (QA) every site in the web archive. This blog post aims give a brief introduction into why and how we QA. The first steps of our web archiving involve crawling a site, using the tools developed by ArchiveIT. These tools allow for entire websites to be captured and browsed using the Wayback Machine as if it were live, allowing you to download files, view videos/photos and interact with dynamic content, exactly how the website owner would want you to. However, due to the huge variety and technical complexity of websites, there is no guarantee that every capture will be successful (that is to say that all the content is captured and working as it should be). Currently there is no accurate automatic process to check this and so this is where we step in. We want to ensure that the sites on our web archive are an accurate representation in every way. We owe this to the owners and the future users. Capturing the content is hugely important, but so too is how it looks, feels and how you interact with it, as this is a major part of the experience of using a website. There are many techniques available for us to use to help solve these problems, but there is no ‘one fix for all’, the same issue for two different sites may require two different solutions. There is a lot of trial and error involved and over the years we have gained a lot of knowledge on how to solve a variety of issues. Also ArchiveIT has a fantastic FAQ section on their site, however, if we have gone through the usual avenues and still cannot solve our problems, then our final port of call is to ask the geniuses at ArchiveIT, who are always happy and willing to help. QA’ing is a continual process. Websites add new content or companies change to different website designers, meaning captures of websites that have previously been successful, might suddenly have an issue. It is for this reason that every crawl is given special attention and is QA’d. QA’ing the captures before they are made available is a time consuming but incredibly important part of the web archiving process at the Bodleian Libraries Web Archive. It allows us to maintain a high standard of capture and provide an accurate representation of the website for future generations.